What services does PRT offer? Where and when do I catch the bus? What do I need to know when catching a bus? Can I take my bike and how do I load it? What is a Fare Free Zone? How do I purchase PRT bus tickets and/or passes? Over the phone: Call PRT at 234-ABUS (2287) with your credit/debit card information and we’ll mail your purchase free of charge. USPS: Mail PRT a check (preferred) or cash (not recommended) and we’ll mail your purchase free of charge. Please note that you should contact PRT regarding any questions prior to mailing in your payment. Mailed-in purchases should include: Name, Address, Phone #, your payment option, and what you wish to purchase. Once your purchase is processed, we will include a receipt. Items will be mailed via USPS within 1-2 business days of receipt of purchase & sent to the address provided. If you do not receive your item(s) within 7 business days, please contact us at 208-234-A-BUS (2287). PRT is not responsible for receipt of items from USPS or delivery of any purchase once they are postmarked and become the responsibility of the USPS. ALL sales are considered final & non-refundable upon purchase or delivery. Find pricing information on Fixed Route Fares and Passes. Use our “Trip Planner” powered by Google Transit to help you get from one point to another using our system. Our route pamphlets contain maps specific to the route pattern and the stops they offer. Call us as 234-2287 (ABUS) any time and we’d be happy to help you. Our drivers are only allowed to stop at designated PRT bus stops (signs and/or bench’s). Decide what time you wish to leave. Find the stop closest to you. Be at that stop a few minutes early (just in case). Have the exact change (we are unable to offer change). If you want a transfer, ask the driver upon boarding when you pay. Are the buses accessible for persons with disabilities including wheelchairs? Yes, all of PRT’s bus fleet is accessible with ADA features including wheelchair lifts/ramps which complies with the Americans with Disabilities Act (ADA) of 1990. PRT is committed to providing services to all customers, including passengers with disabilities. In addition, PRT offers door-to-door Paratransit service for people whose functional ability prevents them from using regular fixed route services. For more information about our Paratransit service, please view our Door-to-Door Services or contact us. What about aides, friends, and assistive/service animals? An aide who assists you may ride for free without charge. Friends may also accompany you, but will need to pay the appropriate fare. Animals that are assistive/service animals ONLY are welcome to ride. When making a trip that requires more than one route, a transfer ticket should be obtained. Transfer tickets must be requested from the driver at the time the fare is paid and are FREE. These tickets will be honored for boarding on any fixed route for one hour after the time issued. Drivers cannot accept expired or altered tickets. Yes, PRT buses have bike racks. Ride to stop you wish to catch the bus & load it for no extra charge. 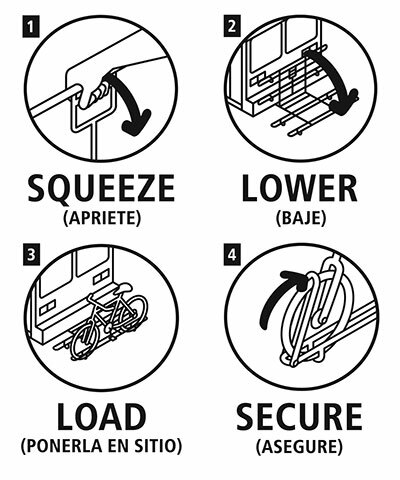 View the video or follow the instructions on the simple illustration below to load your bike. The driver is always available to assist you if needed. Fare free zone simply means you don’t have to pay to ride the bus when you are within that zone which consists of the Idaho State University campus ONLY.